I sort of have a love/hate relationship with gift shopping. I love shopping for my family however sometimes I struggle with finding that perfect gift. Sometimes this leads me to going round and round in circles, which takes some of the fun out of it. Personal Creations has unique personalized gifts for every person and every type of occasion, including Christmas and anniversary gifts. My husband tends to be one of the more difficult people to shop for because he is constantly telling me not to get him anything. Which is just unacceptable. Luckily within just a few minutes of browsing the Personal Creations website, I found a perfect gift for him. He has a love of watches, so I knew he would like the Watch Box to organize and display them. This faux leather box holds up to ten watches with velvet lining. The glass lid can be laser engraved with a 3-letter monogram. It also has a lock and two keys if you want to keep little hands out of it. 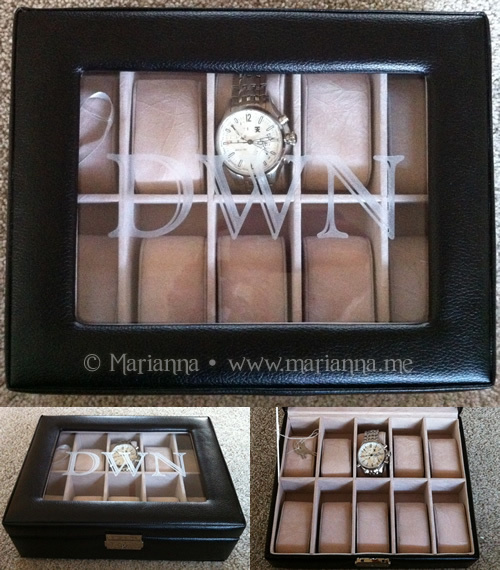 The engraving is big and bold and looks really great with the watch display beneath it. I am definitely very pleased with this. Some of my favorite gifts at Personal Creations are their mugs. Mugs make great, inexpensive gifts for teachers, coworkers, friends, etc. and they have a large selection to choose from. Since my husband is always borrowing my special coffee mug, I decided to get one for myself that he wouldn't want to use and that screams that is belongs to me. The Rhinestone Initial Bistro Mug is a ceramic mug that holds 15 ounces. It is available in red, black, purple or pink and is personalized with any single script initial in rhinestones. This can't go in the dishwasher but it is so worth it for the bling factor. 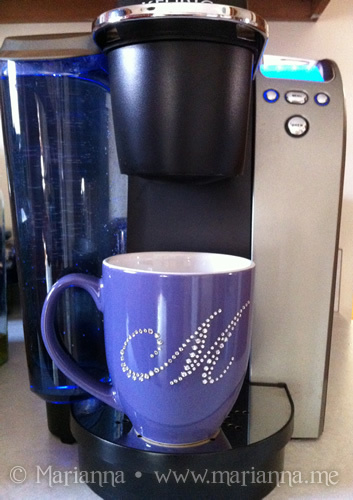 I love my pretty little sparkly mug! Whether you are shopping for your spouse or your child's teacher this holiday season, you are bound to find a unique personalized gift that is just perfect for them from Personal Creations.